Cinnamon rolls are a huge weaknesses of mine when it comes to treats. Who doesn’t love a warm, cinnamony, gooey cinnamon roll, with lots of buttercream slathered on top? But when that craving hits, there isn’t always time to make them, which is why these Quick & Easy Cinnamon Knots are kinda my new best friend. The dough comes together in just a few minutes and from start to finish you should have warm cinnamon knots on the table in under 60 minutes. Now I know you could use pre-made pizza or bread dough for these, but honestly, this dough is so simple to make and comes together so quickly. Aren’t they just so darn cute?! After they bake, the cinnamon sugar mixture and butter oozes out and leave a caramelized layer on the bottom of the knots. . . . soooo good! 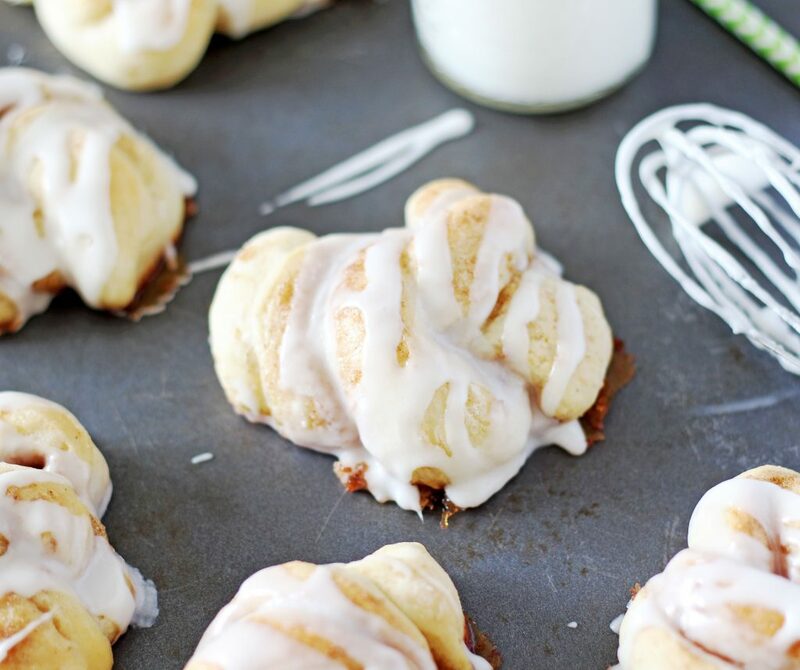 While they’re still slightly warm, drizzle some buttercream glaze over the top and voila, you now have some pretty fabulous cinnamon knots just waiting to be inhaled. I have a little confession to make. I love frosting, so when I ate one (or was it two or three?) 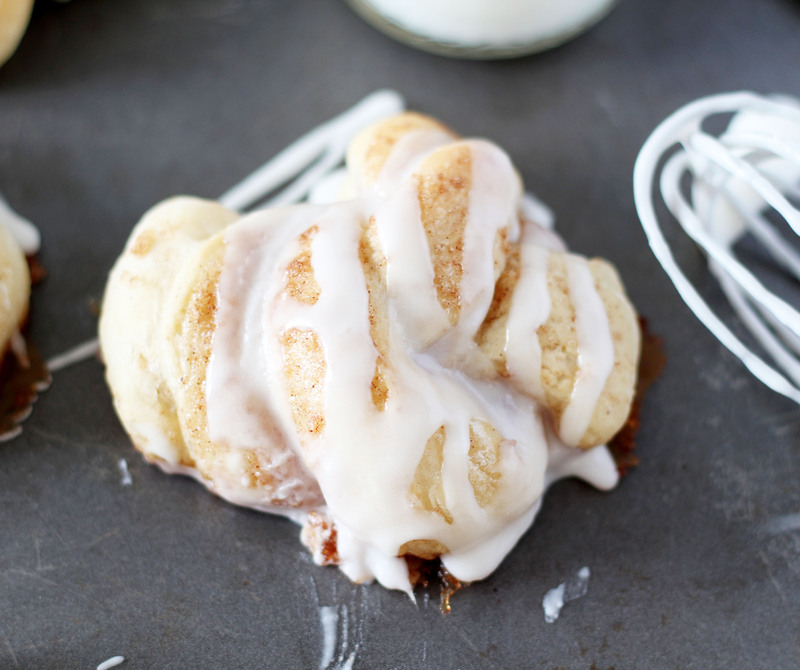 of these cinnamon knots, I spread a big ol’ blob of more frosting over the top and I am not ashamed. After all, a girl’s gotta do what a girl’s gotta do. . . right?! These are totally calling your name! 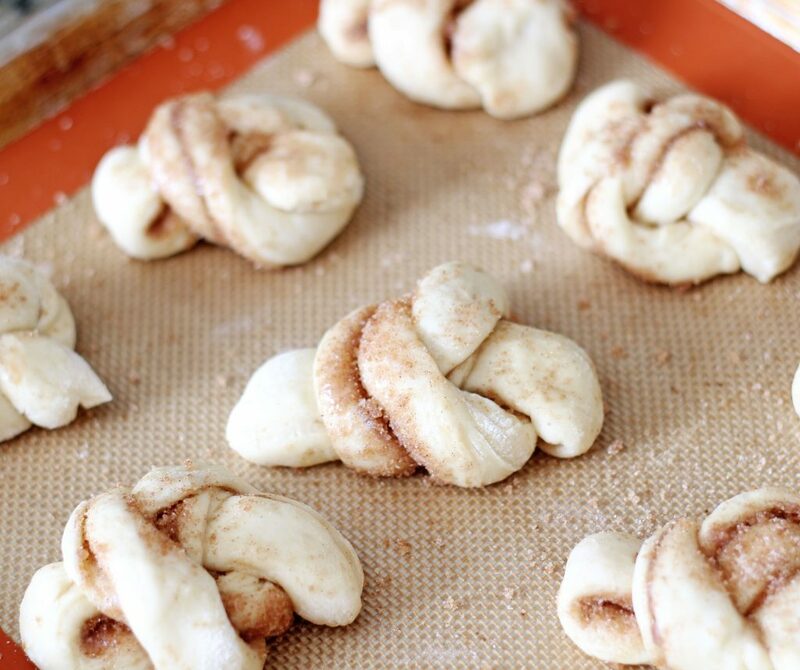 These cinnamon knots are so quick and easy! A great alternative to cinnamon rolls when you're in a hurry! Pour 1/4 cup of the warm water into your stand mixer. Mix in yeast and sugar and let rest for five minutes. Add salt, softened butter, remaining water and 1 cup flour, begin to mix and add remaining flour, a little at a time as needed, to make a soft dough. (The dough will pull away from the sides when you have enough flour.) Continue mixing for about 2-3 minutes or until dough is soft and smooth. Place dough on a well-floured surface and let sit for 5 minutes. After dough has rested, roll into a rectangle (about 14" X 10"). Spread melted butter over dough. Combine both sugars and cinnamon. Sprinkle cinnamon sugar mixture over melted butter, reserving a little for sprinkling. Fold the dough in half (long side to long side) Cut the dough into 12 -14 equal strips (about 1" wide, no bigger or they will be hard to tie in a knot). Tie each strip into a knot. Place on a lined cookie sheet. Brush with a little melted butter and sprinkle with a little more cinnamon sugar mixture. Cover and let raise for 20 minutes. Bake at 375 degrees for about 15 minutes or until just golden brown. While knots are baking, make icing by combining icing ingredients and mix well. 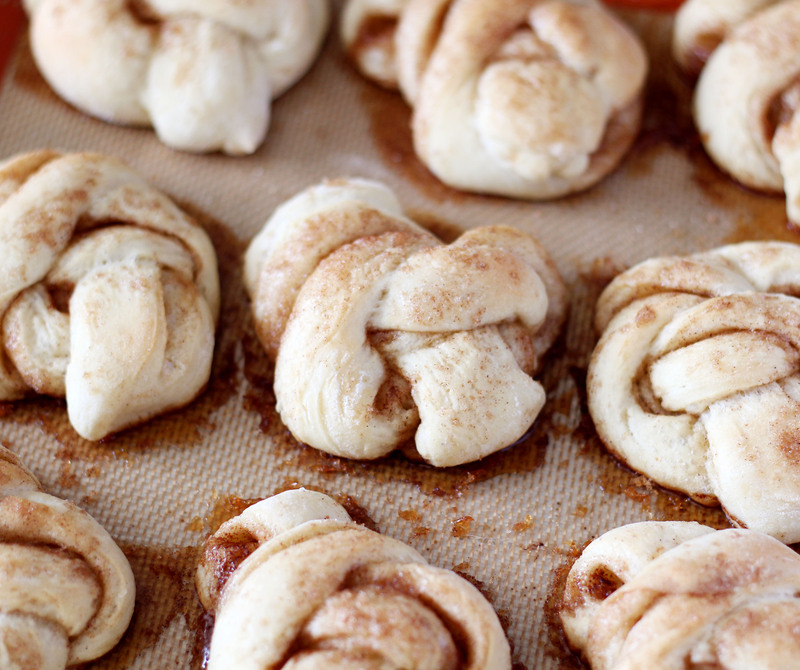 Drizzle or spread over warm cinnamon knots.